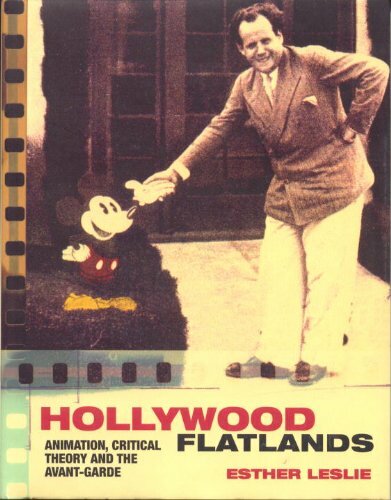 With ruminations on drawing, color and caricature, on the political meaning of fairy-tales, talking animals and human beings as machines, <i>Hollywood Flatlands</i> brings to light the links between animation, avant-garde art and modernist criticism. Focusing on the work of aesthetic and political revolutionaries of the inter-war period, Esther Leslie reveals how the animation of commodities can be studied as a journey into modernity in cinema. She looks afresh at the links between the Soviet Constructivists and the Bauhaus, for instance, and those between Walter Benjamin and cinematic abstraction. She also provides new interpretations of the writings of Siegfried Kracauer on animation, shows how Theodor Adorno&#x2019;s and Max Horkheimer&#x2019;s film viewing affected their intellectual development, and reconsiders Sergei Eisenstein&#x2019;s famous handshake with Mickey Mouse at Disney&#x2019;s Hyperion Studios in 1930. 10 color and 30 b/w photographs. <b>Esther Leslie</b> is a lecturer in English and Humanities at Birkbeck College, London. She is the author of <i>Walter Benjamin: Overpowering Conformism</i> and sits on the editorial boards of <i>Historical Materialism</i>, <i>Radical Philosophy</i> and <i>Revolutionary History</i>.